Long summer days mean even longer rides! Don't miss out on beautiful weather because of the bugs and pests. Summer is in full swing, and equestrians throughout the East Coast, Midwest and Pacific Northwest are rejoicing at the beautiful weather we’re now able to enjoy. Sorry to our friends in the scorching South and Southwest, stay cool down there! We want our horses to enjoy this weather while it lasts, but how can we make that happen when an army of flying insects is constantly antagonizing them? Here at COAT DEFENSE®, we’ve found a few ways to ease your summer ailments with our Powder and Paste. Read below to see how you can help keep your horse healthy, comfortable and happy this summer! Sweet itch is the term used to describe equine insect hypersensitivity. This is a reaction on the skin to insect bites, typically from swarms of tiny midges. 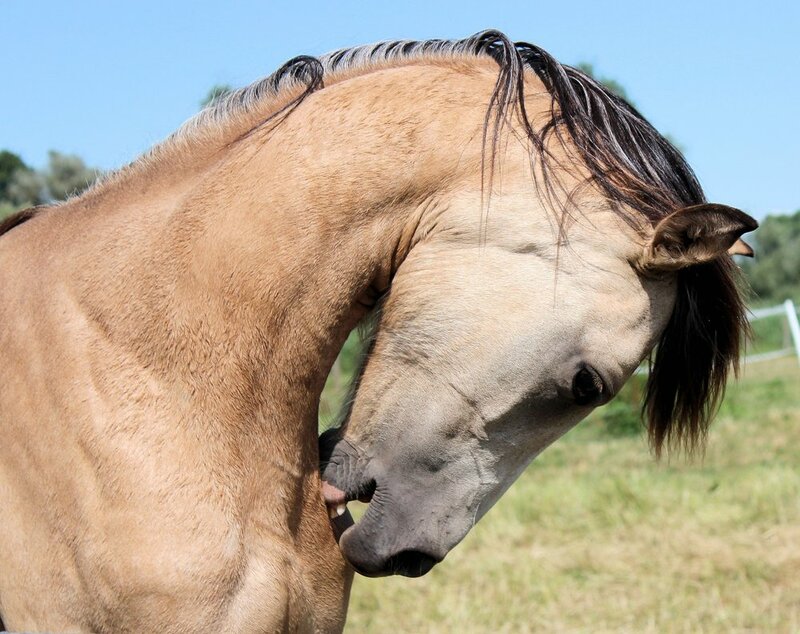 The best way to treat sweet itch in horses is to prevent it, but if it’s too late for that and your horse is already itchy, miserable, covered in tiny bumps and rubbing off hair, we have the solution for you! To treat sweet itch, simply sprinkle our COAT DEFENSE® daily PREVENTATIVE POWDER to the affected areas on your horse. Rub it everyday before and after turnout to see the best results. This will provide a protective barrier to stop future bites from swelling, while drawing out the toxins from the existing bumps. If your horse has scratched the tiny bumps to open sores, you will want to use the COAT DEFENSE® TROUBLE SPOT DRYING PASTE to enable healing in the area, while also aiding the regrowth of rubbed off hair. The paste creates a protective barrier that bugs can’t penetrate, while also repairing the damaged skin. It’s a win-win! Stall during the hours of peak insect activity. This is typically dawn and dusk. Use fly sheets and spray to ward off the culprits. Afternoon turnout means flies, night typically leads to mosquito bites, so pick products accordingly. Rub or brush COAT DEFENSE® daily PREVENTATIVE POWDER into the coat, with or without a fly sheet and spray. The formula will help prevent bite reaction and keep your horse comfortable. 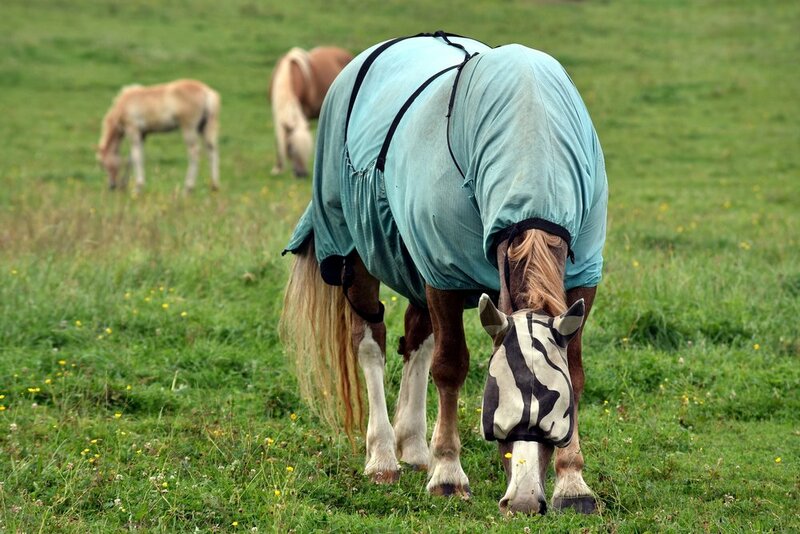 A flysheet can help reduce the risk of sweet itch in horses. A tiny scrape or bug bite can turn into a nasty summer sore virtually in the blink of an eye. Preventative measures can help you avoid these situations, however, if your horse develops a summer sore, you want to make sure it’s treated before it worsens. A summer sore is a wound that is classified by the fly larvae that infects the open area. Once the wound has been relieved of the invaders, you simply apply COAT DEFENSE® TROUBLE SPOT DRYING PASTE to the affected area and protect the area by keeping it clean and clear of bugs. Do not wash the paste off daily, allow it to sit and begin to flake off on its own before rinsing and reapplying. The best way to prevent summer sores in horses is to keep insect populations in and around the barn as low as possible. Clean stalls and small pastures often. Use bait and traps to keep insects away from horses. Use fly sheets and fly spray to minimize exposure to larva. Any open wounds should be wrapped or covered with COAT DEFENSE® TROUBLE SPOT DRYING PASTE to create a protective barrier. Bugs are a real nuisance for any horse, be sure to inspect before and after turnout for any bites that have become inflamed, are bleeding or causing discomfort. Fly bites in horses are nasty things. They hurt and typically bleed, all while driving our horses absolutely crazy. These bites tend to become large bumps with scabs on the head, and can take their good ole’ time to heal. In order to treat fly bites in horses, apply COAT DEFENSE® TROUBLE SPOT DRYING to the clean scabs, and reapply as necessary. This will help draw out toxins and enable healing, along with creating a protective barrier. To prevent horse fly bites in horses, follow the same guidelines as above by using fly sheets and sprays, cleaning stalls and pastures to remove manure and breeding grounds for flies, turning out at times when flies and insects are low, and using COAT DEFENSE® daily PREVENTATIVE POWDER on the coat to prevent future reactions. 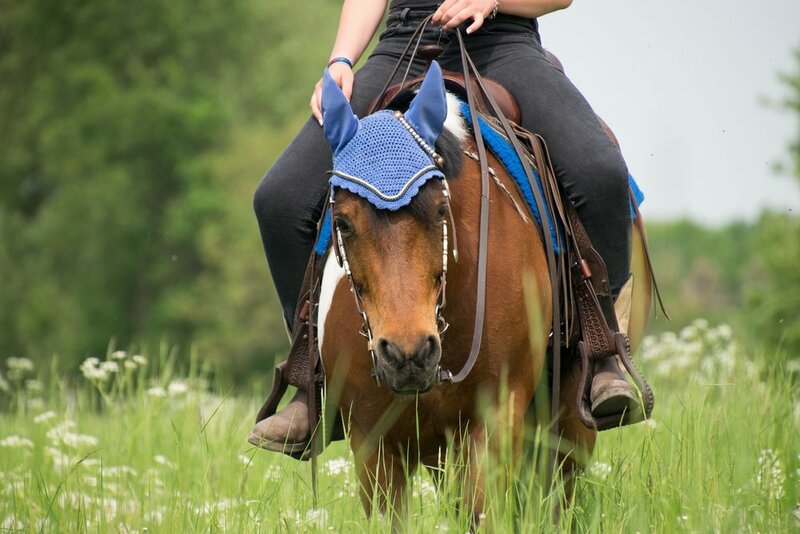 Now that you have some insight on how to treat and prevent summer sores, sweet itch and bug bites in horses, get out and enjoy your summer! For many of us, it won’t last long, so we have to make the best of it. Keep your horse safe, comfortable, happy and healthy during these warm days by adding a little COAT DEFENSE® to your daily routine. From all of us here at COAT DEFENSE®, Happy Trails!